Several months ago, the New Yorker published a long essay about vegetarian and vegan cookery. In the process, it critiqued a number of cookbooks of the vegetable stripe—recent titles like Plenty, Vegetable Literacy, and Veg. In this post, I intend to rise to The Moosewood Cookbook’s defense, but also to do a little historical correction and think a bit about the cycles of revolution and how they are overwritten. So, to begin. 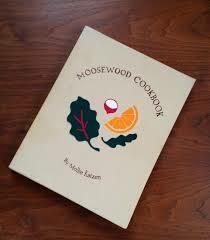 Remember The Moosewood Cookbook reader? Two things. The Moosewood Cookbook was published in the late 1970s as a product of a popular café in Ithaca, New York (yes, called Moosewood!). It was communal in style, with many people doing cooking duties. The cookbook was originally a stapled-together version of handwritten recipes that diners had begged for. More importantly, perhaps—and the point completely missed by the New Yorker–it was one of the first American cookbooks to say that vegetables could be it: could be the main part of your meal. Essentially, they moved vegetables from an afterthought on the margins of a plate to a possible (and desirable) centerpiece. It was a decisive break from the cooking of the 1950s (think Betty Crocker, and even Joy of Cooking). And not only in its emphasis on vegetables: it was far more international (baba ganoush rather than meat and potatoes), and it encouraged handmade rather than technological production. (Betty Crocker is a fictional character designed to give a human face to the laboratories of General Mills.) Betty Crocker cookbooks look like a slickly produced version of homey. Moosewood was designed, even after it was picked up by a mainstream publishing company, to look like a spiral bound, art-filled, hand-drawn book. I started to read some of the history of Moosewood (and two other revolutionary cookbooks, The Tassajara Bread Book and Frances Moore Lappé’s Diet for a Small Planet) because I was really struck by the New Yorker writer’s dismissal of Moosewood (and lack of mention of other two). At one point, these 3 constituted something of a holy trinity in the college towns among which I moved. More importantly, they revolutionized American cooking in a way that the cookbooks that followed them didn’t. And that’s what I want to talk about in the New Yorker’s de facto history of the vegetable cookbook. Because she dates the revolution very differently: to Deborah Madison’s Greens restaurant (started, like Moosewood, before the cookbook) and the eponymous cookbook that followed. Coming soon…more on American (Food) Revolution.